I am a Software Tester possessing overall experience of 3.9 Years. In this period I have worked on 3 web based projects. Those have been successfully tested by me apart from this...Read moreI am a Software Tester possessing overall experience of 3.9 Years. In this period I have worked on 3 web based projects. Those have been successfully tested by me apart from this I have a rich experience in mobile testing. I am enthusiastic and passionate towards my work and believe in to deliver quality product. 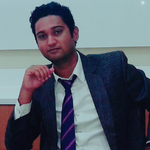 I posses the working experinece with Manual as well as Automation testing. In the Manual testing I have the skills of creating Test cases, executing test cases, reviewing the result and creating tractability matrix. I am expert in all kind of testing types e.g. Sanity, Smoke, Retesting, Regression, Adhoc and user acceptance testing. I am well versed in testing techniques e.g. Boundary value analysis and equivalent class partitions. On the other hand in Automation testing I am expertise in Selenium web driver, Test NG framework and Page object model also I have good experience in Appium Automation tool for the mobile testing. With the above mentioned skills I can assure you to deliver on time and Quality product.